This is how I spent some of my time today. I started my first art journal! What a wonderful gift to myself on Mother’s Day. Everything happens in it’s own time and this is a prime example. I’ve been looking at and admiring many artists’ art journals while following a parallel path on my own art journey. 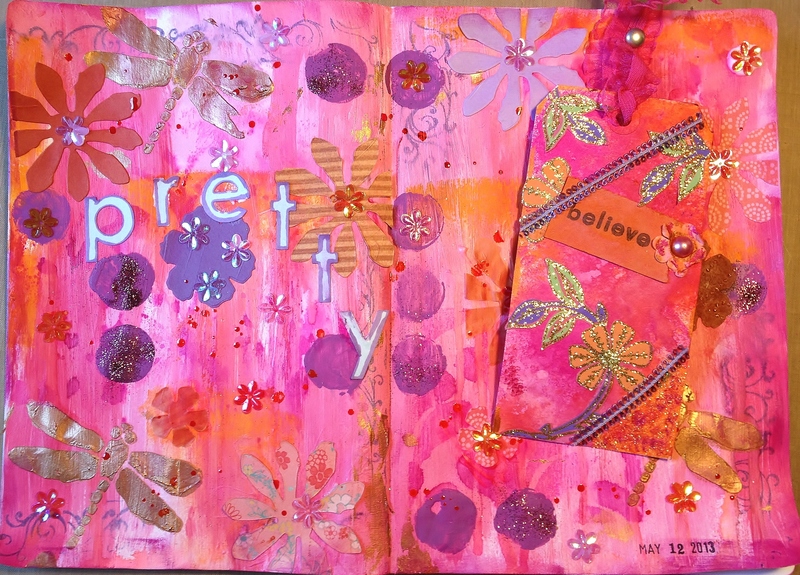 Always thinking that I would do some art journaling someday, later, or tomorrow. Right. Recently while shopping for some other MUST HAVE NOW art supplies I happened across the rack of art journals. I’ve been through this routine before and I’ve looked at probably dozens of art journals without ever purchasing one. Just call me Goldilocks–I wanted one not too big, not too small, the paper had to be not too thick, not too thin, the cover had to be flexible but not flimsy–maybe I should be called Her Royal Highness MS. Goldilocks. In any case this time all journals were 40% off so I began the routine of fondling perusing all the journals. I mean ALL the journals. Spent about 20 minutes before I found IT. THE ONE! The perfect size (7″x10″), the perfect weight and feel of paper (#120 lb), the perfect cover (nondescript and unadorned but not plain). Did I mention it was THE ONE??!! Took it home and…put it on the shelf for a couple of weeks. I moved it around several times because it kept getting in the way. I picked it up and looked at it several times. The pages were so white and so blank and there were so many of them. I put it back on the table. It seemed no matter where I put the damned thing it kept being in the way of what I was working on. There was no way the Universe was going to let THE ONE get lost in the shuffle. 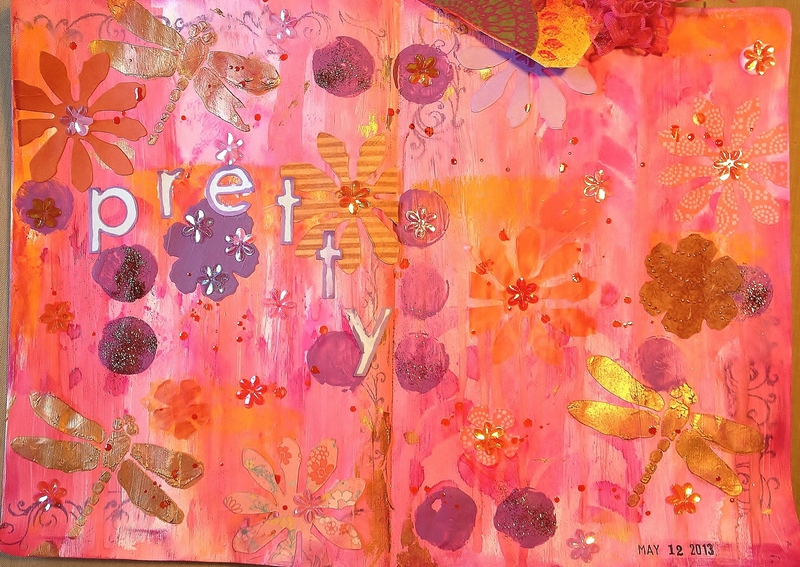 So today on “my” day, Mother’s Day, I opened my new art journal and played. I got all the pretty colors on the page from the feeling in my heart as I reflect on my blessings of true love, sweet family, good friends, good health, and the companionship of a sweet dog. Only someone with all the blessings you just listed could achieve quite the purity of colour I see here. Gosh, my first journal pages were abysmal [I’m not modest, I’m telling you the truth!] I love this! Thank you Pauline! Colors make me smile and very happy! Thank you Ellie! You should give it a try sometime–all you need is paint and your fingers! Hi CelticMama! Good for you beginning a new volume of your journal! Sounds like it will be filled with lots of parts of you. Thanks for visiting me today. You’re welcome and thank you, too. Have a great weekend. You have gift! Keep it up and Never look back! Great gift to pick! I love all the colors and shine. Orange and pink are a delightful combo. Hi Yolanda! I am so on an orange and pink kick right now. I cannot get enough of it lately! WOW, I love the colors and I completely understand about finding the right journal. I have lots on my shelf that haven’t been touched because they just don’t feel right. Blessings to you and can’t wait to see more pages. Thanks for visiting Marci and for your compliment. We journalers seem to be a picky bunch about what we share our thoughts, art, dreams in!